Answer: What are the names and styles of those buildings? I solved the problem of building #1 by using the “fill in the blank method” using the * operator. "Adam Grant" Building. Google Streetview. I then switched to Google Street View to look at the building next to it. Now the problem is that there are two directions to go looking for the second building. 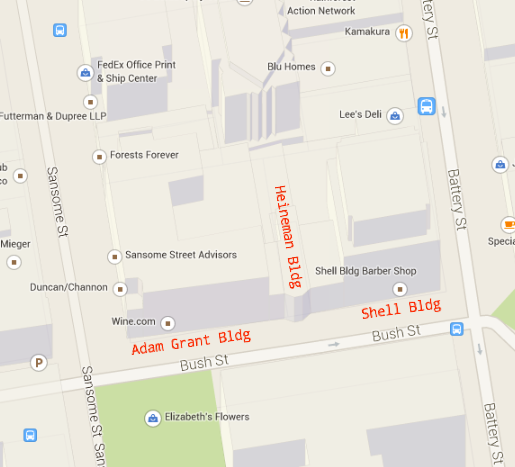 Since the Adam Grant building is on the corner, you could go down Bush Street, or down Sansome Street. 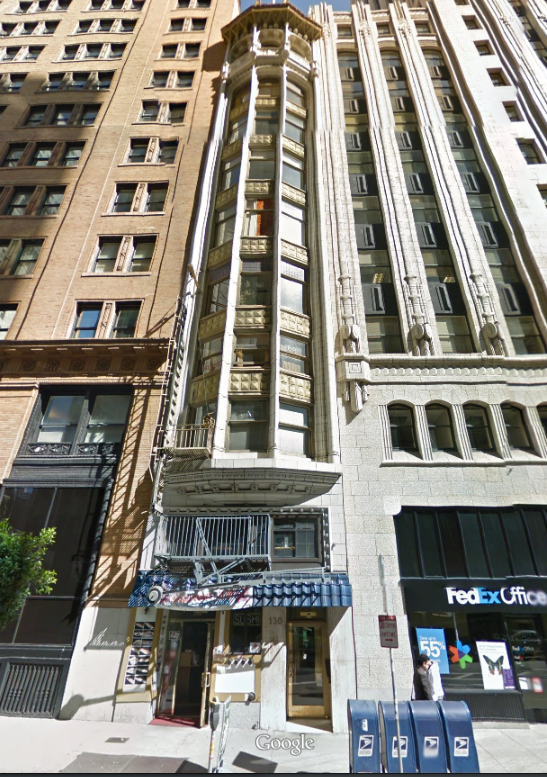 But the building at 140 / 142 Sansome is pretty plain; certainly not “more beautiful” than the Adam Grant building at 100 Bush. So let’s Streetview down Bush Street in the other direction. If you move down Bush street you’ll see that there’s a building front at 130 Bush. But look carefully—it’s definitely white and beautiful (with a distinctive outward thrusting “oriel” style), and it’s also VERY narrow. Look carefully at this picture and you’ll see what I mean. Truthfully, when I was driving, I thought that it was all part of the much larger building next to it on the right as you look at this picture... the well-decorated Shell building at 100 Bush. 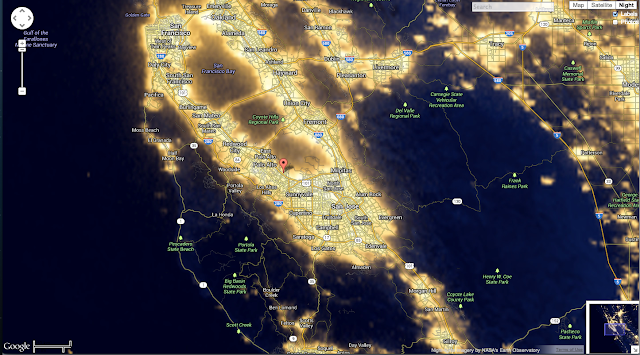 That’s actually the one I meant, but maps are useful for illustrating the truth of the situation. And once I looked at the Maps view (with 3D outline of parcels), you can clearly see the outline of the building at 130 Bush AND the building at 100 Bush (the Shell Building). This tall, but narrow building is fairly remarkable. It's technically the "building next door," but I completely missed it in real life! So.. what’s the building at 130 Bush? ..told me that this was the Heineman Building. This “elegantly slim, 10-story building” was once the tallest of its neighbors, and decorated in a “gothic façade” with terra cotta tiles and copper panels. It was originally a necktie, belt and suspender factory. (This is from the SFGate article on theHeineman Building, quoting the book “130 Bush: An Illustrated Story About FourBuildings and a Monument in San Francisco” by L. G. Segedin. The Wikipedia article on the Shell Building points to the architectural website Emporis, which describes it as a combination of Moderne, and Art Deco. The Adam Grant building, the one that started us off on this search, is described by Emporis as a Beaux-Arts building that was completed in 1908, but then extended upward by 8 floors in 1926. Emporis is a nice collection of architectural data. It’s entry on the Heineman Building describes it as neo-gothic and completed in 1910. So it must have been the tallest building around for around 16 years until the Adam Grant overshadowed it… which in turn was surpassed by the Shell building just a few years later. They’re all beautiful buildings—1908 (then 1926), 1910, 1930—a time of grand skyscrapers. Search Lessons: I note that, strictly speaking, the * operator for the “fill in the blank” wasn’t necessary, but it worked beautifully in this case. When you only have part of the puzzle, the * will match 1 or more words to fill in the pattern in a quoted phrase. Good tool to remember. WRT “authoritative” resources—I would have accepted entries from almost any book on the architecture of downtown SF. There’s a great wealth of them, all the ones I’ve seen are nicely researched. 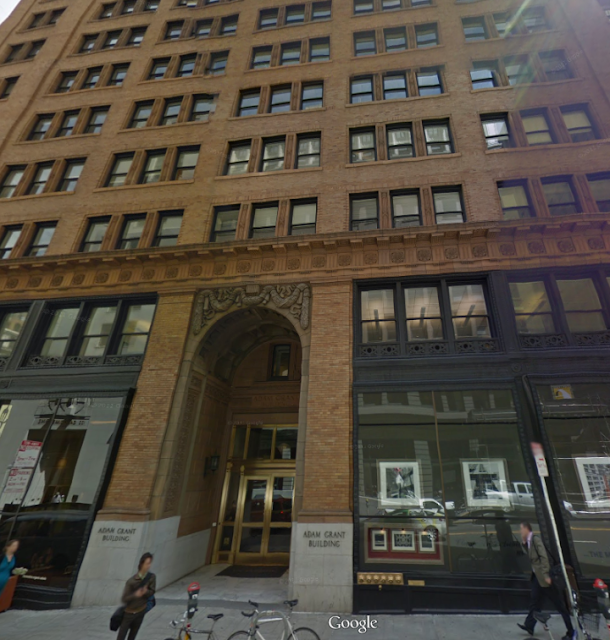 Wednesday Search Challenge (6/26/13): What are the names & styles of those buildings? I was driving through downtown San Francisco on a beautiful, sunny day. As I drove, I passed a pair of beautiful buildings that I wanted to learn about. As I passed the first building, I saw the name and quickly jotted it down on a pad of paper I keep in my car for just such moments. Looking at my pad later, I saw that I wrote down the name as the “Adam Green” building in SF. As I drove down the block, there was an even more beautiful building next door. I didn’t get the name of this second building, all I know is that it’s a light, almost white color. When I got home and tried to look up these two buildings, I started with the “Adam Green” building, but was surprised to learn that there *isn’t* any such named building in San Francisco! Obviously, I made an error in transcription. 1. Can you figure out what the name of the two buildings are? As we always do, please tell us HOW you solved this search challenge, and let us know how long you took to solve the challenge! Today we have a special edition of SearchResearch. I'm attending the annual conference for Investigative Reporters & Editors and giving a 1 hour (fast!) 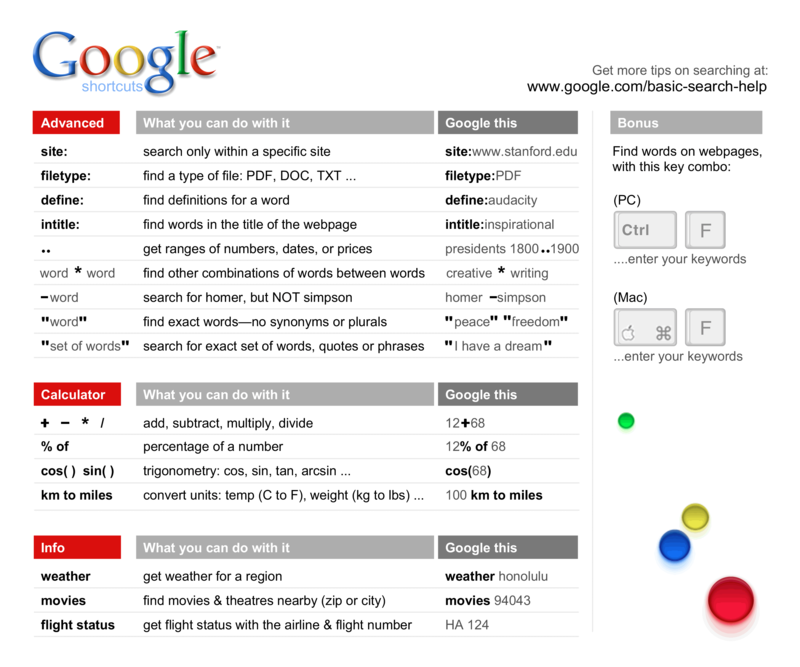 tutorial on some aspects of advanced Google searching. I figured everyone might like to see this presentation, so I've put my notes here... This also serves as a TipSheet for the attendees at IRE. * Motivating problem 1: What kind of trees are these? What's that bell? - Maps tools – GPS location tool (CHECK: Does this work in new maps? Answer: How hard can it be? What color is the roof? I’ve been slightly holding off on saying anything because I’m enjoying watching all of the comments coming in from the SearchResearch literati. Excellent job! 1. 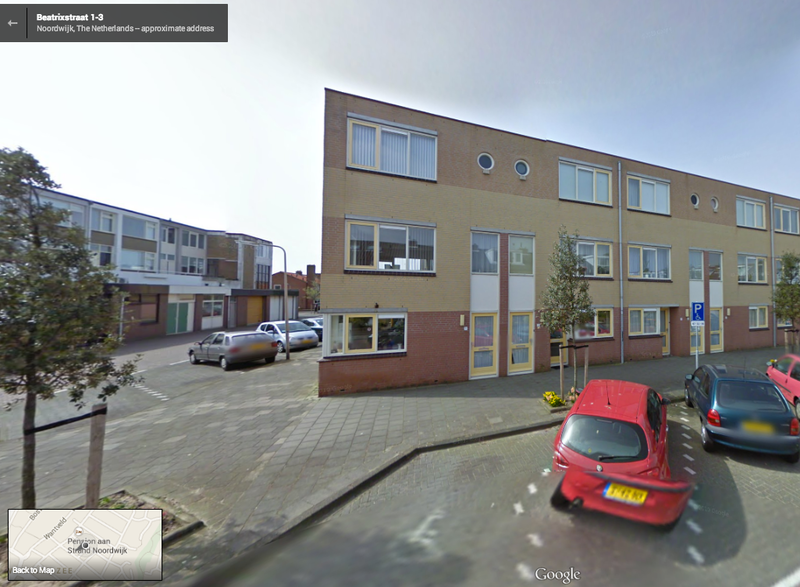 What is the color of the roof at Beatrixstraat 5, Noordwijk, Netherlands? The obvious approach here is just to use Google Maps and look at the roof. 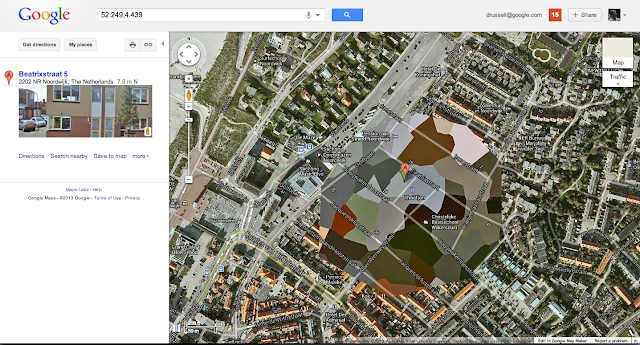 BUT, as you can see, this part of Noordwijk is obscured by a funny tiled pattern. Oddly enough, you can still get Google Streetview for this part of the city, just not the aerial view. You see the problem. The roof is flat at Beatrixstraat 5. Ignore the Dali car with a misaligned bumper. don’t get too locked into a single information provider. For anything. If you can’t find it one way, try another source. 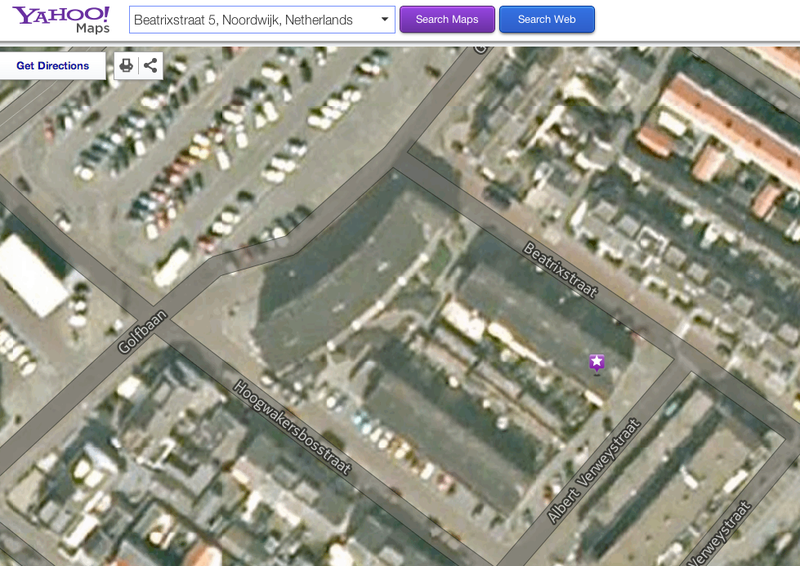 In this case, there are multiple other ways to see the rooftop at 5 Beatrixstraat. I can go on in this vein. So clearly, Google received a “please obscure this aerial view” request from someone (or some entity) in this area. But also, just as clearly, it’s either out of date, or the requester isn’t especially savvy about this kind of thing. If you’re interested, the Wikipedia article on Noodwijk has a wonderful link to GeoHack (the Wikimedia Tools) that lists all (currently) known maps and satellite imagery for the Noodwijk area. 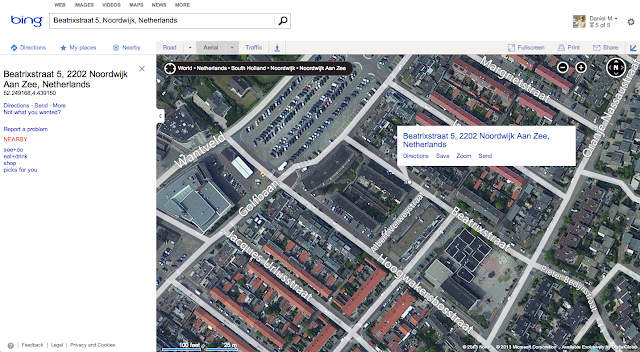 The Wikimedia Tools "GeoHack" that shows all imagery for a given location. This tool generalizes as well. If you have a lat/long it will tell you what imagery resources are available. Here, for instance, is the GeoHack listing all image resources for the GooglePlex. The dark areas are woods and open spaces. It's one of the reasons I love living here. 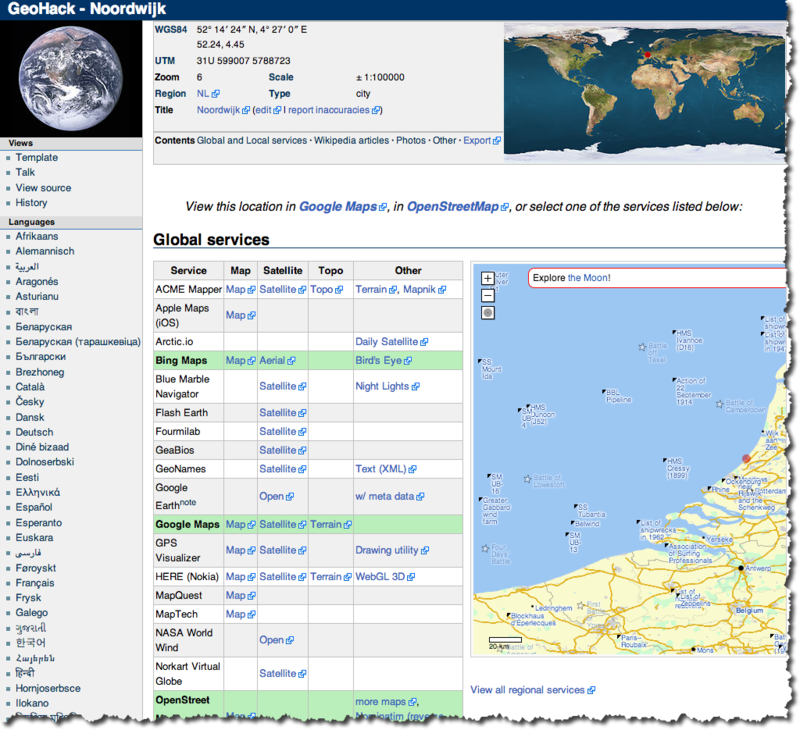 More generally, the GeoHack tool will list all of the known imagery sites for ANY location. And even more generally… try to use multiple information resources to confirm or triangulate on your questions. 2. Why is this part of Nordwijk obscured? What’s up with the strange obscuration on Google Earth (and Google Maps)? This quickly leads you to the hypothesis that the reason for hiding is the presence of ESTEC (European Space Research and Technology Centre). "The blurring in Noordwijk marks the site of the former headquarters of the Defense Pipeline Organisation, overseeing the Dutch part of Central European Pipeline System (CEPS). However, the DPO headquarters have been relocated to the Hague years ago." And there's a link to the Wikipedia page with a list of "Satellite map images with missing or unclear data". And likewise, ESTEC is at Keplerlaan 1, a few km south of the blurred area… that’s also an unlikely rationale. You can check out ESTEC's website at: http://www.esa.int/About_Us/ESTEC Since they have video tours of their site, it seems unlikely that this would be the reason for the blurring. So.. thus far, we don’t have a definitive reason! Yes, I could go to the next building at the Googleplex and ask, but that would be cheating! We’re trying to figure this out from the open web. Bottomline: sometimes you just can’t come up with a definitive answer. Rats. Keep searching. 1. Don't become overly reliant on one source. Remember there are multiple providers for most data. Seek them out and see what THEY say. Stay flexible. Answer: Who came up with this big idea?